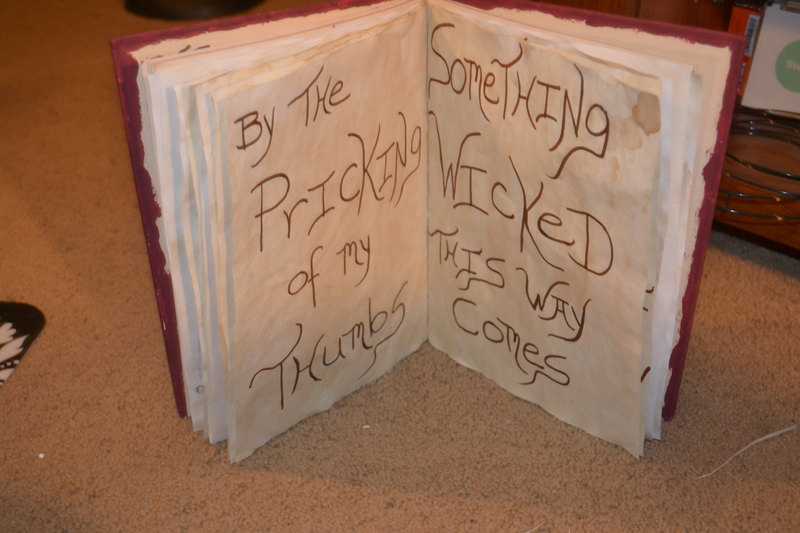 How Not to Make a Spooky Spell Book – A Kbatz Kraft! Inspired by having extra tea stained pages from my Spooky Bottle Labels project, Old Kbatz here decided to make a Spooky Spell Book. Not having some of the right materials, however, led to some time consuming mistakes. First I selected a book to decorate. Many bibliophiles and macabre folks love the idea of these often expensive stacks of creepy looking books but none of us really want to damage a book to make one! You can go to a local library sale of thrift store and choose an old outdated encyclopedia or reference book. However, even after purging my books for a move, I still had several cookbooks I wasn’t using. This one was large enough on the front to do the design I had in mind on the outside and I intended to stick my tea pages in the middle of the book. In theory, it’s still perfectly usable as a cookbook should I ever need some kind of hamburger recipe that can’t be found online. I sketched out my wording with a marker and then traced over the lettering with Tacky Glue. Maybe the hot glue gun would have been quicker, but Tacky Glue allowed me a little more time with a toothpick as I perfected the letters. If you’re doing this with the kids, it might be easier to paint first and then make some lettering with a more friendly glue and some glitter, however I didn’t want this to be sparkly glam, just an old innocuous book with a goofy plastic scorpion I glued on the front. Once the glue was dry, I colored over the white glue with black marker so it would stand out more as I painted the rest of the book. It was okay if I got some on my letters or scorpion, because I intended to go over them at the very end with a final coat of black. 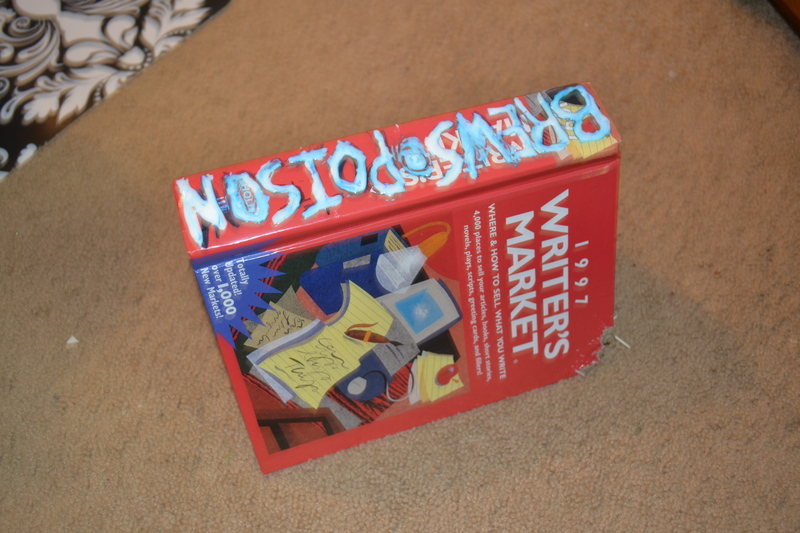 Using red paint, I went over the book cover. Unfortunately, the red paint peeled and chipped off as it dried, and another coat did the same thing. I wondered if there was a sheen to the book that should have been sanded first or if it was the paint itself. I liked the contrast of the bright red with the black, but this poster paint kept peeling and never had good coverage. I debated doing a third or fourth coat and having to go buy some kind of artist spray sealant. By time I did all that, I could have just bought a spooky spell book! The next day, I let all the red paint chip off and decided to try using a smaller tube of acrylic paint I had called Berry Wine. I did small sections on the back of the book and let them dry – sticking and with better coverage! I like the aged, deeper color more than the bright red, but I thought because I had a smaller quantity that there wouldn’t be enough for the book. Instead, the acrylic paint covered more and went further without all the terrible peeling. After a few coats of the berry paint dried, I went over the lettering and scorpion with one coat of black. Lesson learned: I’m not an artist at all, and knowing which materials work together and having the right supplies to do a project is paramount. Now I was able to work on my interior pages. At first I was going to trace assorted ye olde symbols, but that is also out of my artistic area of expertise and I didn’t want anymore mistakes. Instead I wrote Macbeth quotes on the pages in colored pencil making slightly oldeth calligraphy style lettering before going over the wording again in brown marker. Here I was careful of the order I wanted for the pages and which quotes I wanted to be showing when the book was opened flat. I also didn’t use both sides of the pages or use the marker when they were stacked together lest any ink bleed through. It was back to the Tacky Glue as I made a line down the left side of the pages one at a time, gluing them together to be inserted in the exact middle of my cookbook. I trimmed the right side of the pages so they wouldn’t stick out as much and made a line of glue on the inside of the book to insert the pages. This was a spur of the moment project that took several days longer than it should have thanks to my painting errors. 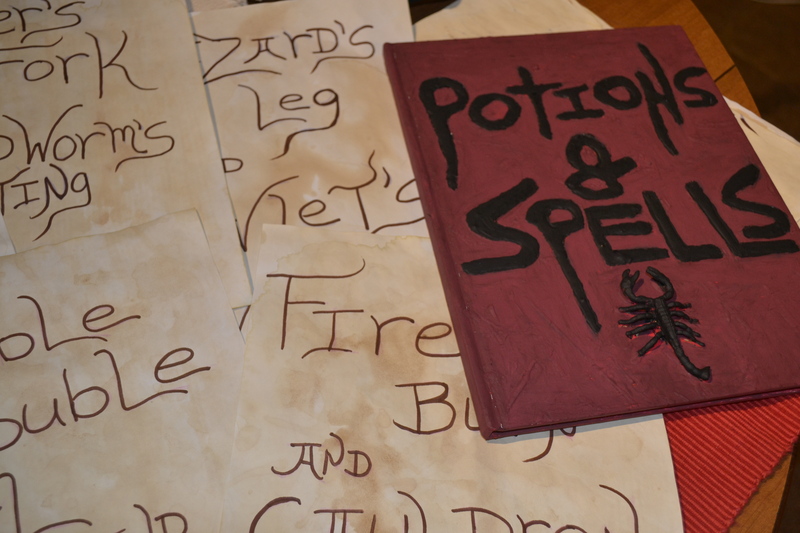 It looks great now that it is complete, and once I realized which paint worked best, I was able to make another spellbook that took less than a day. Although I had gotten rid of several old Writer’s Market editions in my move, I still had a beat up hardback 1997 edition on my shelf that was thick enough to do some spine wording. Again I sketched my letters and traced them in glue. This time I used a green marker to make the lettering stand out, for I was painting this book with black acrylic paint that covered in less than two coats. For the letters, I wanted a contrasting yellow, however, the yellow paint and green marker have blended together to create a creepy looking color. I may go over it again to make it more golden, but I kind of like the icky look. This book I can also use again if I wanted, however I’m tempted to use it as the base of a spooky cloche – but that is another Kbatz Kraft!